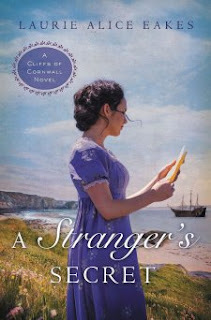 "A Stranger's Secret" by Laurie Alice Eakes is the second in the Cliffs of Cornwall series. Lady Morwenna and her infant son are left alone in the world after the death of her husband. Rather than accept the help of her overbearing/well-meaning grandparents, Morwenna is trying to survive on her own and restore the estate which will be her son's inheritance. When an unconscious man washes up on her shore after a boat wreck that she is presumed to have caused, Morwenna's life is turned upside down. Who is the mysterious man and why does he have a medallion with her family's crest on it? When I first began reading, I found myself getting drawn into the story, but as the novel progressed it felt a bit redundant and the end felt rushed. Themes in this novel include: trust, pride, parent/child relationships, love and mystery. As the mystery unfolds, Morwenna and David struggle with their suspicions of one another and with past hurts and secrets. Their feelings for one another are complicated by the fact that they have no clue how their lives are interconnected. The storyline between Morwenna and David was interesting, but I found the secondary characters and their interactions with the protagonists and with one another much less so. Two gentlemen were referred to by their first and last names throughout most of the novel, but at times referred to by only their first names and at other times by only their last names. Since I wasn't reading the book in one sitting and since those characters weren't very compelling, I had to stop and think "Who is this?!?!?" and then go back in the book to remind myself who was who. Anyone who knows the play/movie "Rosencrantz and Guildenstern are Dead" (inspired by Shakespeare's "Hamlet") knows what I'm talking about when two characters always seem to appear together and are nearly interchangeable. This novel refers to God, but isn't very strong on message. I don't expect every Christian book I read to have a strong Christian message so this isn't a negative -- just a point worth mentioning. Overall readers who are interested in the 19th century and who enjoy romance may like this book.